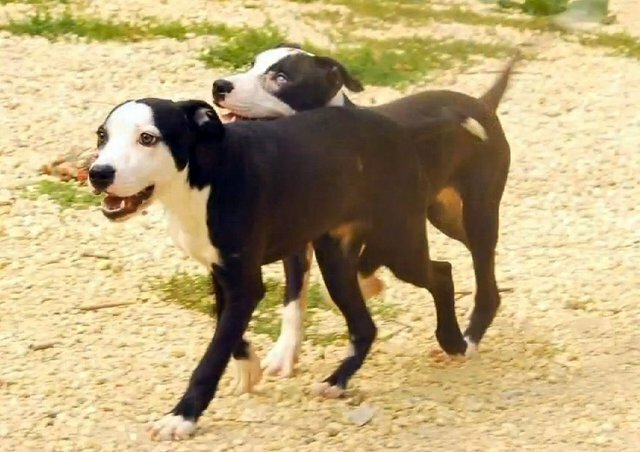 Last week, the story of two lab/pit mix puppies, siblings Jeffery and Jermaine, captured national attention after being found abandoned and left to fend for themselves on the cold streets of Philadelphia. Jeffery, blind since birth, would have stood little chance if it weren't for the loyalty of his brother, who served as his seeing-eye companion. Their heartwarming display of brotherly love was epitomized in a photograph shared by Operation Ava, a no-kill animal shelter that took in the needy strays. Jeffery and Jermaine, whose short lives had known little comfort or affection from anyone else, comfort one another as they await an uncertain future. Thankfully, after an outpouring of support and appearances on local and national media, Jeffery and Jermaine now have a new home. Finding a family ready to adopt both puppies, being mindful and patient with Jeffery's special needs, might not have been easy -- but when Jonathan Hochman and Veronica McKee walked in, shelter staff knew they were the right fit. "It really was just a gut instinct. We saw them together and we were like, this is the family that [it] just needs to be," says Operation Ava CEO Claudia Gutierrez. At just 8 months old, Jeffery and Jermaine have a long life ahead of them, setting aside the burden of neglect they experienced early on for the love of a new home. And most importantly of all, they'll share it together.